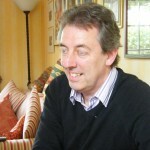 Maurice Kachuk wrote to Eversholt2 to say that his Mum, Winifred Bunker, was born in the cottage opposite the Red Lion. In her days, it was thatched, and divided into two separate cottages. Winifred’s grandmother, Mary Ann Bunker, already has her own page here. Maurice and Winifred came to Eversholt in May 2012 and brought photos and memories to share. Thank you very much, Winifred and Maurice. Copyright of any items on this page remains with the original copyright holders, please. Contact us here if you’d like to make copies. 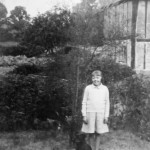 The whole little estate in Witts End was then owned by the Duke of Bedford, the cottage where Winifred was born, the house now known as Witts End Close where Anna Blomfield now lives, and the large barn. 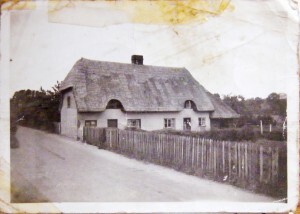 This is how the cottage looked about 1938 (click for a much bigger version). That’s Winifred and her father, Frederick Bunker, in the doorway. Here’s the same image made in 2012. You have to stand high up on the bank, almost in the hedge, opposite the entrance to The Close to see this. It’s still not quite right! The cottage was renovated in the 1990s, because it was in very poor shape. It’s a lovely single house now. The thatched roof has been replaced with a tiled one, with a lower roofline, but the chimney hasn’t moved at all in 70 years. Frederick Bunker worked on the Bedford Estate. 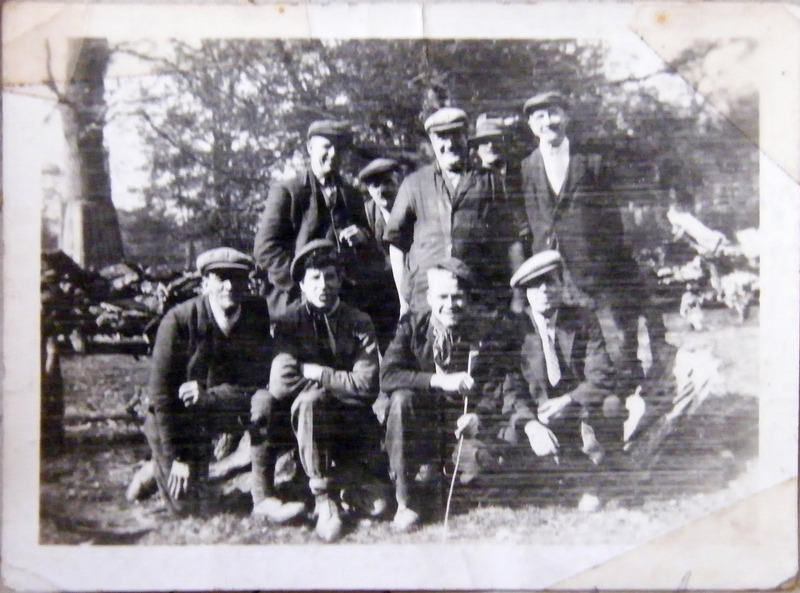 He’s the rightmost chap in the front row of this picture of estate workers from the 1930s. Here’s a gallery of more family photos. Click each for a bigger version. Winifred remembered electricity coming to Eversholt in about 1933. 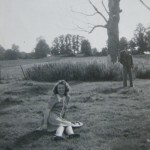 Water was another matter: she used to have to fetch two buckets of water for the day, every morning, from the well in Anna Blomfield’s front garden. 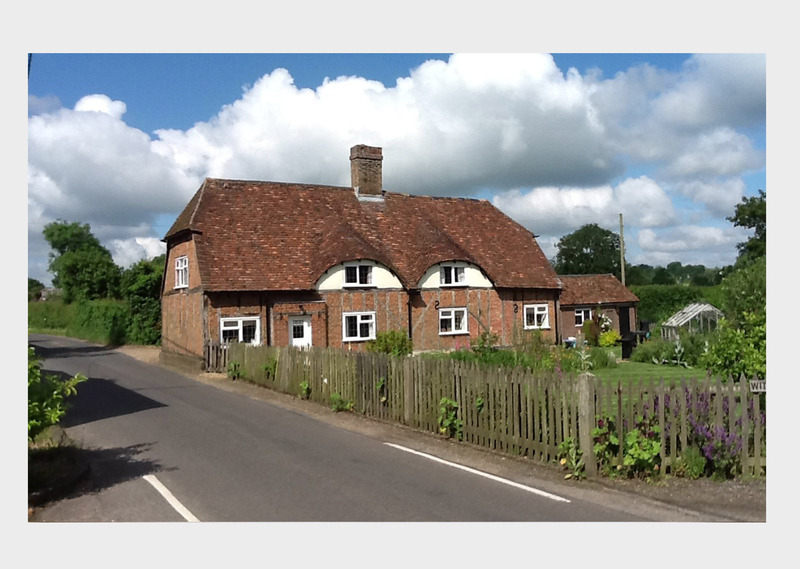 In Winifred’s time at Witts End, what is now Anna’s house was divided into two cottages. Of these, the one on the left looking from the road was empty and almost derelict. Winifred remembers working for Fred Turvey, picking up potatoes during the harvest. During the war, Winifred could stand in Witts End and look south and see the flashes of the bombs falling on London. Winifred left Eversholt when Frederick Bunker lost his job at the Bedford Estate (and thus his house) in about 1948. 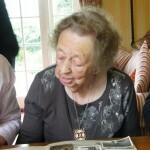 I’ve spoken with mum and Emily Bunker was Frederick Bunkers sister (Winifreds dad). Mum vaguely remembers Doreen Dixon but is interested to know who the great aunt is who Lindsey visited and where was the tied cottage. 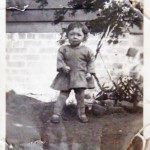 By 1963, mum had left Eversholt and was living in Ampthill with my brother who would have been 9 and me aged 1. 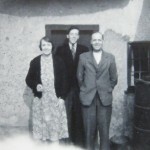 So the cottage wouldn’t have been the one mum lived in with her parents – Frederick and Lilian Bunker. Opposite the Red Lion pub as was. I’ve told mum to put her thinking cap on again and as the info comes to mind I will gladly pass on anything I can! Your Mum and my Mum must have been first cousins. 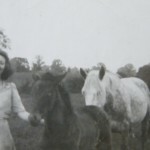 But my Mum (Doreen – known as Dorrie) never lived on the Duke of Bedford’s estate. Her mother, Emily – your Mum’s aunt – had a child out of wedlock. Maybe that’s why she moved to London where she married an Irishman (Henry Dixon) and went on to have another 6 children. 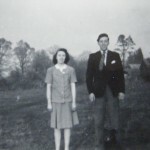 Dorrie was born in 1925 and lived in London till she was 14 when they moved to Cardiff – where she married a Welshman, William Williams, my father. I’ve no idea I’m afraid who we went to visit in 1963. Please pass on my very best wishes to Winifred as I think we’re first cousins once removed…and you and I are second cousins, Maurice. It’d be wonderful to meet you all – I live in Gloucestershire so do let me know if you’re ever in this area.